Indra loved the river, the mother of all creation. It was like returning to the womb. Clear water, crisp surfs. Paradise indeed. After the river day was done, after the waves good food and a clear sky. That is what he loved. It brought him back home in isolated wonder the troubles of the world were far away. Pure Land Expeditions are pleased to have the best international river guides supplying a premier range of expeditions across the Himalayas. This long expedition on the Karnali is perfect in every way – we run both schedule and private groups on this class 3-4(+) run situated in the far wild west of Nepal. 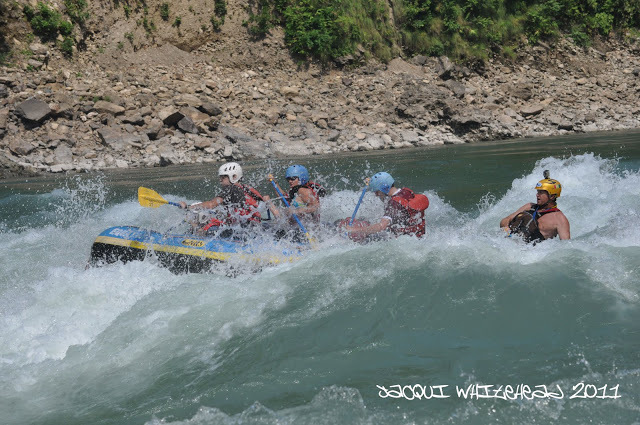 Our early year trips are perfect big water introductions and later after Monsoon the Karnali offers crashing waves and holes with more power and force. We offer this trips from both India and Nepal, for India based trips please contact us direct for schedule from Kathgodam railway station . Arrive in Kathmandu. You will be met by one of your guides and transferred to your hotel. Today you will explore the amazing city of Kathmandu. Taking one of the many rickshaws you will jet around town visiting some of the incredible temples. Those driving to the river join the private bus today. After breakfast we finish packing our personal gear and make the domestic airport for an hour long flight to Nepalgang, taking in the amazing Himalayan views along the way. Its then a short bus ride and short trek to the river where we raft up and float downstream to our overnight camp. Safe in the knowledge that life will never be the same again. Today is the day, Nepal’s longest and largest river, the Karnali, begins its life near to Tibet’s holy Mount Kailash. It carves its way through the Tibetan plateau and through the Himalaya into Nepal’s lush western forests. After the snow melt this river becomes a raging torrent with huge rapids which offers brilliant rafting and kayaking. A highlight is the 7km long gorge which is one long raging rapid. This is one of the Nepal’s must do rivers a classic wilderness experience. The first few days on the river offer hit after hit of amazing rapids running big continuous whitewater with the series of canyons and rapids in double figures. Later in the trip the river mellows out and allows us to enjoy the amazing scenery, fish and solitude of the river deep in the jungles of Western Nepal. As we settle and begin drifting down from the last camp we come to the huge bridge at Chisapani where we pack away the rafts and head for the airport at Nepalgang for a flight back to Kathmandu. Free time in Kathmandu for shopping, also added as an extra day should we need it on the river. After a rather leisurely breakfast we take you back to the airport for your return flight. to Kathmandu. Book as a group of 4 or more kayakers and receive free guiding at the end of your trip. Private dates available for groups of 10 or more, raft or kayak. On all trips, both private and schedule the expedition includes all logistics, guides, expedition food, hotels and camp team. We have available hire kayaks, from old school playboats to more modern creekers, please email info@purelandexpeditions.com if you wish to hire a kayak, we have a wide selection available. We also hire paddles, pfds, skirts and helmets. Are you a trainee river guide, do you want experience working and running a trip? contact us now for further details on our trainee guide logbook scheme.